Opera has now come to version number 19. Or is it 20… Hmm, this version numbering is getting out of control. We have a fast developing cycle. The reason why we have a version number inflation is because of the way we work now. Version numbers are of course very useful for change logs and technical documentation, so we’ll stick to that for now. The bookmarks bar gives you a fast access to your favorite sites, just turn it on in settings. This is a simple way of storing, accessing and modifying your bookmarks. For easy modification you can create bookmarks by dragging and dropping from tabs (windows only). Think of it like a quick access bar to get around fast to your favorite sites. Moreover, the full bookmarks API is also live now. Play with it and check it out! You can now pick from more than 700 extensions for your Internet browser, and this number continues to grow. The newest release provides blacklisting of extensions, inline install and a few other improvements. The full bookmarks API is also exposed, so we expect some great, new extensions shortly. Check out our extensions catalogue. Rip up the Opera cabinet and get ready to get dirty on the inside of our product. Sorry for the cheesy marketing sentence, but we’re honestly excited about this and can’t wait to hear how you will use it. There are only two or three new settings for now, but we’re planning to add more. The most important thing is that this feature now exists in Opera and we’re committed to adding new features and open up Opera even more. Within the next two weeks, we’ll promote the experimental Opera Developer build to the feature-complete Opera Next stream. The developer channel will be also updated to the newer version, so you can try out some new stuff. We have provided many important bugfixes too, read the full changelog for details. 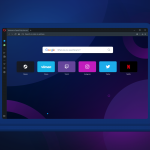 Previous article: Updated network installer – Opera Developer 20.0.1387.9Next article: Opera 19 auto update is back again.